Most European stock indices ended Monday’s session in positive territory, playing catch-up after Wall Street’s sharp rally last week. 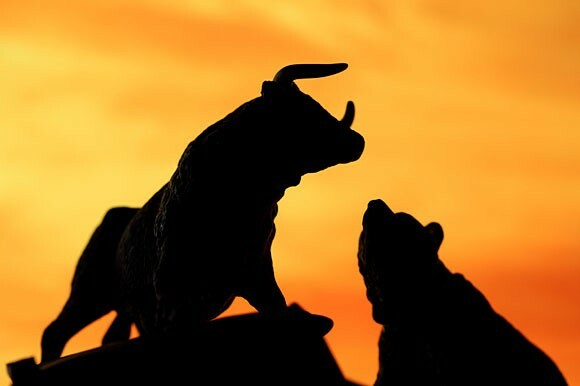 On Friday the Dow, S&P 500, NASDAQ 100 and the broader-based Russell 2000 all ended at fresh record highs, having posted positive closes on all four trading sessions in the holiday-shortened first week of the New Year. Yet it currently feels as if global stock indices have got a bit ahead of themselves. It’s not as if there’s been any outright negative news. As things stand investors still appear happy to buy equities independent of economic data (see Friday’s disappointing payroll number), geopolitical risk or anything else for that matter. US stock indices are at record highs despite the Federal Reserve tightening monetary policy. In fact, underlying financial conditions remain highly accommodative even after the Fed raised rates by 125 basis points since December 2015. At the same time, global growth is ticking higher in a coordinated fashion, corporate earnings are strong and Trump’s tax reforms look set to goose equities further as US corporations repatriate overseas cash and use the corporate tax cut to buy back stock and pay out dividends. While stock indices are well overdue a significant correction, it’s difficult to see where the trigger for a sell-off could come from. In any case, investors remain convinced that the Fed along with other central banks would quickly step in to counter any downturn in equity prices. That may not be the traditional role for central banks, but it’s certainly what they’ve done over the past nine years or so. This has meant that bouts of profit-taking (particularly over the last twelve months) have been brief and shallow as investors jump on any opportunity to buy dips. But it’s worth noting that last month saw the first decline in Bank of Japan’s (BOJ) balance sheet since 2012. The BOJ began tapering its own programme of quantitative and qualitative easing (QQE) just over a year ago. But this is the first time in more than five years that there’s been an actual reduction in the size of its balance sheet. The drop-off came in Japanese Government Bonds (JGB) with the suggestion being that the BOJ chose not to reinvest the proceeds of all its maturing JGBs. It’s also interesting that this balance sheet reduction was quietly pushed through without fanfare. Meanwhile, the European Central Bank (ECB) continues with its Asset Purchase Programme (APP), but at a sharply lower rate. It first tapered the APP to €60 billion per month from €80 billion in April last year. This month the ECB reduced its bond purchases again to €30 per month with the programme now set to run until September this year. However, ECB President Mario Draghi was explicit in saying that the central bank reserves the right to extend its APP both in size and duration should this be warranted by economic conditions. This is understood to mean if inflation fails to trend higher towards 2%. Last week headline Euro zone CPI slipped to +1.4% annualised from +1.5% previously. More worryingly Core CPI (excluding food and energy) was unchanged at just +0.9% from the same period last year. This suggests that despite a pick-up in growth across the whole Euro zone, tepid inflation may stay the ECB’s hand when it comes to reducing stimulus further. Another major market theme is ongoing dollar weakness, particularly against the euro. The greenback lost around 17% between January and September 2017. This was despite rallying sharply in the aftermath of Trump’s election victory which helped the EURUSD slip to a fourteen-year low this time last year. But the EURUSD subsequently rallied in a move which came about against a backdrop of tighter monetary policy from the Federal Reserve. At the same time the ECB continued with quantitative easing in the form of its Asset Purchase Programme (APP). The central bank has now extended the programme by nine months to September 2018 although it reduced the pace of purchases to €30 billion per month from €60 billion. But investors were obviously less concerned about interest rate differentials between the dollar and euro than they were about other fundamental factors. They bought up the euro as GDP picked up across the whole of the currency block, not just the core led by Germany. In addition, concerns that Eurosceptic parties were set to grab power in Holland and France proved ill-founded. Meanwhile, it also became apparent that President Trump’s efforts to “Make America Great Again” would need a weaker dollar if they were to come to fruition. But now the EURUSD is butting up against resistance just below the 1.2100 mark while the Dollar Index has yet to retest its September low around 91.00. Today’s trade saw the EURUSD pull back sharply. So far the move looks like little more than profit-taking following the pair’s failure to take out resistance. But this was given some extra impetus by the reminder that Germany remains without a government three months after the General Election. This week Angela Merkel is meeting with the SPD in a last ditch effort to form a workable coalition. But if this fails then she faces the prospect of going back to the polls. So the question now is if the EURUSD can break out above the 1.2100 level? If it does, then most traders expect the dollar to continue to decline. But a failure to take out resistance could lead to a sharp sell-off for the euro considering speculative positioning. There was a jump in dollar shorts last week which has the potential to reverse quickly if there’s a sudden change in sentiment.